That old saying, “Out with the bad, And in with the good” could well apply to those last ice fishing opportunities on many of the Inlets and Bays that permeate the Great Lakes. Because as the old bad ice is leaving, a good new batch of walleyes is coming in. 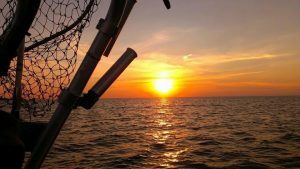 That unnoticed timetable that spawning walleyes fallow has little to do with how warm or cold it is outside, and more to do with how much daylight each day is starting to receive. This key along with their maturing eggs starts them on their shore bound shallow water migration to the various rivers they will eventually run up and spawn in. Often, areas for miles up and down the shorelines from these spawning river mouths can be red hot for pre-spawn walleyes. Of course being safe and having safe ice under ones feet during these last ice opportunities can and should always be a main concern. But if the winter has been normal or even more severe than usual, chances are good the ice thickness alone will hold well into mid to late March. 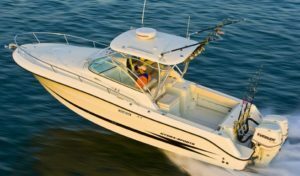 This is the time when more than a few things are in the fisherman’s favor. Pre spawn fish are usually in the feeding mood. They instinctively know they need to bulk up and feed as much and as often as they can. The spawning ordeal, the nutrition needed, and the energy used for the trip up river, all means (eat all and any time you can) for the migrating walleyes. So a lot of things once hard, are made easy for the fisherman. Finding that magic depth usually won’t be a factor. I’ve seen and caught walleyes in water as shallow as 3 feet during this time, when they are both actively searching for prey or any outbound water flow from rivers or any main drainage they can swim up into and start their reproductive ritual. The choice of lures also becomes narrower. Seems anything that flashes and has that added piece of minnow flesh gets the aggressive attention of the pre spawn walleyes. Little Cleo’s, Do-Jiggers, Swedish Pimples, Warrior Jigs and a host of other spoon type lures all work. 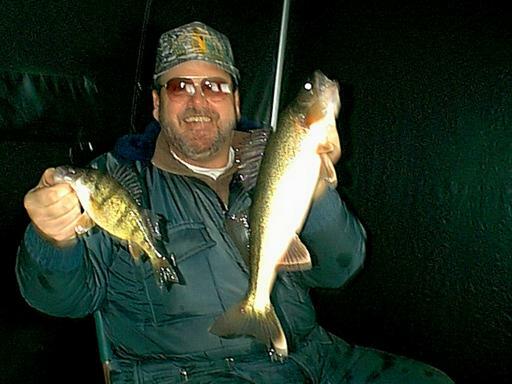 All the walleyes finicky feeding behavior experienced during the midwinter, gives way to reckless feeding abandon during this time. The usual prime-time fishing hours don’t seem to change much during this pre-spawn period. Even though that old wives tale about walleye being afraid of bright light has been proven unreliable, they do still seem to both forage and roam a lot more during the low light periods. Especially when venturing into these shallow close to shore areas. 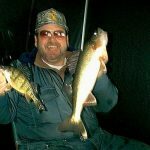 So early morning predawn to about 10:00 am, and again from 3:30pm till a half hour after dark, would be considered prime time for fishing late ice walleyes. Try to be set up an hour before these prime times, as the shallow water and the noises associated with ice fishing can spook walleyes pretty easy. As far as gear goes, I’d spool up with just a little heavier line than with what I used for the deeper waters. You won’t have that deep water cushion to play with after you set the hook in these shallow water torpedoes jaw. And they’ll have a whole lot more strength and pep, when not under that deep water pressure funk. You’ll be tempted to just keel haul them out, as they’ll be right under the ice when you set the hook. Be careful. Some of the biggest walleye of the season can and will be caught during this time. And that adrenaline strength one gets when to excited, may cost you the biggest walleye of your life. Good fishing. . .